Dry air and allergies: this is a story as old as time itself. By now, you probably already know that dry air is the culprit responsible for many nasal congestions, dry cough and inflammation of the sinuses, cracked and irritated skin, and even dandruff. 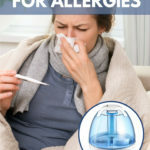 Needless to say, if you’re suffering from allergies, breathing dry air isn’t going to help you get any better. But how exactly does dry air affect your allergies? Why Does it Affect it?